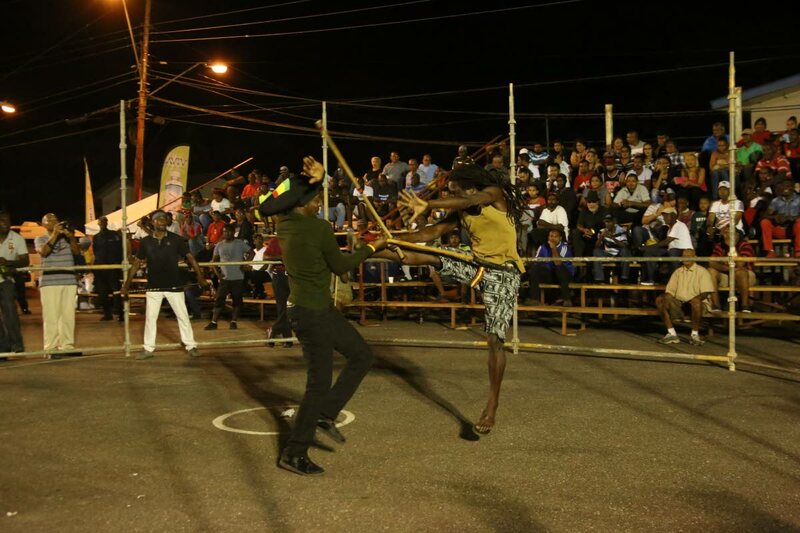 Stickfighters put on an exhibition match after National Carnival Commission judges left the National Stick Fighting Competition at the St Mary’s Basketball Court in Moruga on Friday night. They were supposed to fight each other for the King of the Rock title. But instead, stick fighters trained their bois (French patois for stick) against the National Carnival Commission (NCC) as they refused to step into the gayelle for the preliminary round of the NCC’s National Stick Fighting competition at St Mary’s basketball court, Moruga on Friday night. The fighters are demanding an increase in prize monies as they claim the art of stick fighting endangers their body with very little compensation for injuries they may receive in the gayelle. The action stunned the mammoth crowd of spectators, as well as the NCC judges, the majority of whom had endured an agonising ride to St Mary’s village on roads which, at times, tested the wear and tear on both man and vehicle. NCC chairman Colin Lucas described the action yesterday as akin to an “ambush” as no indication had been given beforehand about the impending action. “What happens when something like this takes place is that it undermines the confidence of the organisations involved be it the stick fighters or whoever. Asked whether the stickmen had ever asked for increased monies prior to the incident, Lucas said, “At a previous discussion, something of that nature had arisen and it was dealt with so there was no way, there was nothing to have prepared the NCC for what happened last night. Lucas said he was not ruling out the possibility of the competition being rescheduled once discussions were held with the respective parties. However, former King of the Rock champ O’Neil Odel said stick fighters had decided to go on strike as they were not given the respect due to them and were often treated as drunkards. Odel said they were demanding that the champion gayelle be given $100,000 while the individual champ be given $70,000. He said all fighters were prepared to boycott the competition should the NCC fail to accede to their demands. After the NCC judges packed their belongings and left the stage, several fighters then staged exhibition matches to showcase their talents for the large crowd that remained. Reply to "Stickfighters strike NCC"